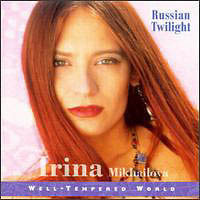 Russian Twilight is the quintessential female vocalist audiophile demo disc. Recorded in hdcd on the scoring stage at Skywalker Sound in Marin County, California, all the ingredients for a first-rate listening session are securely in place. Make up your favorite list of attributes in your mind and rest assured that, save for truly deep bass, they're all accounted for. This includes - somewhat more rare than such events would appear to promise to outsiders - fresh and exciting musical content that likely none of your audiophile friends has been exposed to before. Supported by steel drum, cello, Jew's harp, sitar, zarb, different flutes and balalaika, depending on the track, this is the type of music that floats on and in space. It's simply yet sophisticated, allowing you to relax, perhaps to admire the subtle reflections of Habib Khan's sitar off the walls of the recording venue, to relish the bloom of Hans Christian's cello, or to follow Irina's slim voice as it lithely meanders down melancholy melodies of Eastern origins. One could think of Mikhailova as a spiritual sister to Loreena McKennitt who, while pitching her musical yurt in sparser, less luscious places than the Canadian, expresses a similar trans-global message of contemplation and inner voyages. Born in Kazakhstan and trained at the St. Petersburg Academy of Music, Mikhailova's native cultural influences include Christian and Muslim, Greek, Turk, Russian and Mongolian. Because of the sparse instrumentation, these influences make themselves mostly felt in the melodic, free-floating structures that conjure up vast lonely places, of shepherds perhaps on the high plains, or a solitary encampment on the open steppes. One of the album's highlights is surely the track entitled Zahodila Luna. It features the Romanian caval, a close cousin to the cimbalom, in an imitation of steady but gentle rain pelting on window shutters, with a Chinese yan chin flute intoning a recurring sad Do�na-like fragment, while Irina's emotive voice, beautifully tempered by control, follows chromatic half-tone progressions and engages in that peculiar melismatic style that is typical of certain Shamanic traditions. You wish for this tune to never end. When, after nearly eight minutes, it finally does, you feel as though returning from somewhere far away, a secret inner place to which you had drifted off fully awake, yet somehow unloosened from the moorings of everyday reality. While a 1997 release, this album is still readily available and should be on the short list of listeners who would value its exotic gentleness, its refined sonics and non-mainstream rarity status.